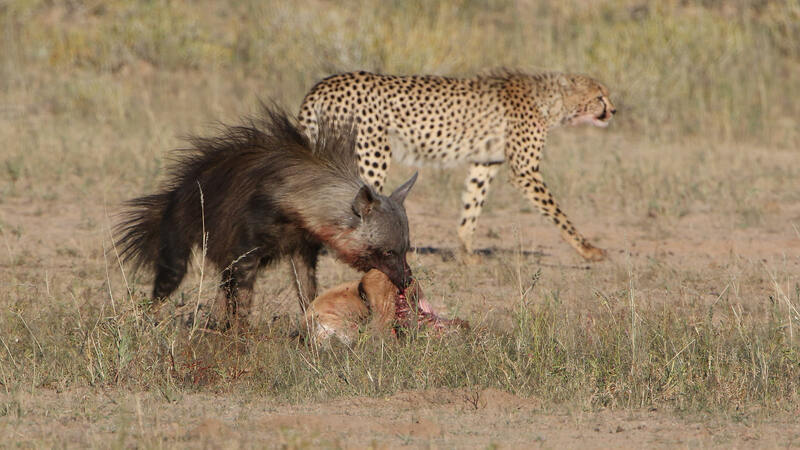 In the Kalahari Desert, one such carnivore is the brown hyena. Last April, photographer Derek Keats documented the cool, calm, and collected manner in which that hulking beast – which looks, in a wonderful way, a bit like a demonic hound – goes about pilfering from the cats. 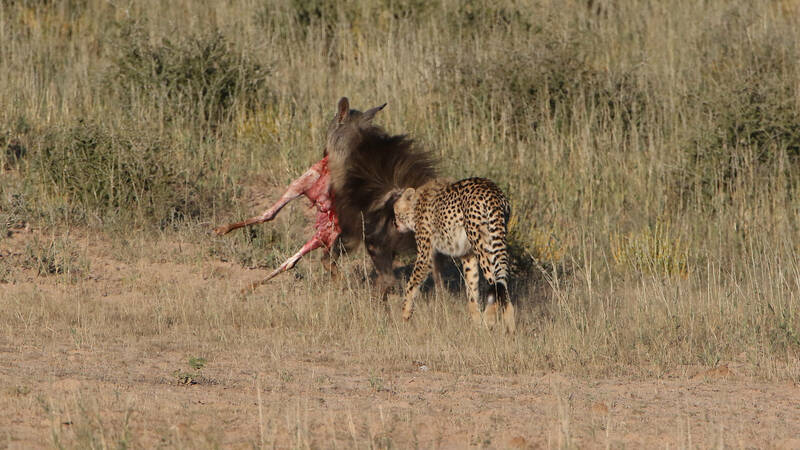 Unfortunately for the cheetah quintet, the hyena wasn't through: it reappeared not long after, hurrying back to the carcass and then summarily hauling off the rest of it. 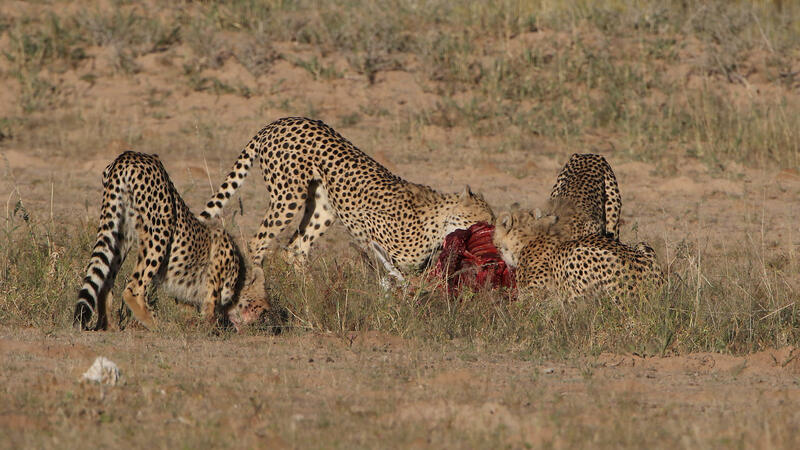 "The cheetahs looked absolutely dejected," Keats wrote in a post over at Africa Geographic. "The jackals then took their change to move in, cleaning up the intestines and other nasty bits." The brown hyena is the southern counterpart of the striped hyena of North and Northeast Africa, both of them being large, solitary-foraging scavengers; their bigger relative the spotted hyena, which outranks them in the rough-and-tumble carnivore hierarchy of the African bush, is a more accomplished group hunter. The brown hyena prowls the semi-arid wastes of southwestern Africa, including down to the Namib Desert seacoast, where it's often called the "strandwolf" or "strandloper", a gleaner of beachwrack and part-time stalker of seal pups. Brown hyenas are happiest when they can adopt the kills of more predatory carnivores, and their heavyset build and powerful jaws mean they can actively displace some of them. 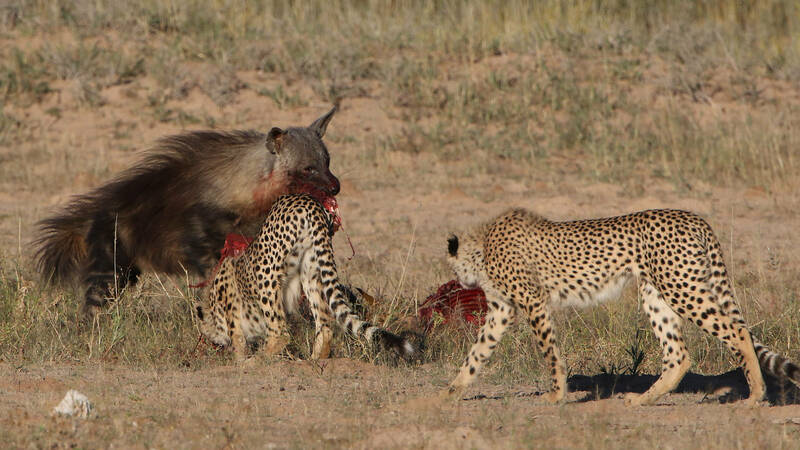 As Keats's photos attest, even a well-outnumbered brown hyena can rob cheetahs, who are loathe to get in a scrape with the bruiser scavenger. "When a [hyena] sees a cheetah it often runs in its loping gait toward the cat to investigate, apparently to see if it has made a kill," wrote the authors of a 1978 study on Central Kalahari brown hyenas. Lions are another matter: brown hyenas take pains to avoid them and wait awhile after they've left a carcass before coming in to scavenge. Spotted hyenas and African wild dogs also usually dominate brown hyenas. 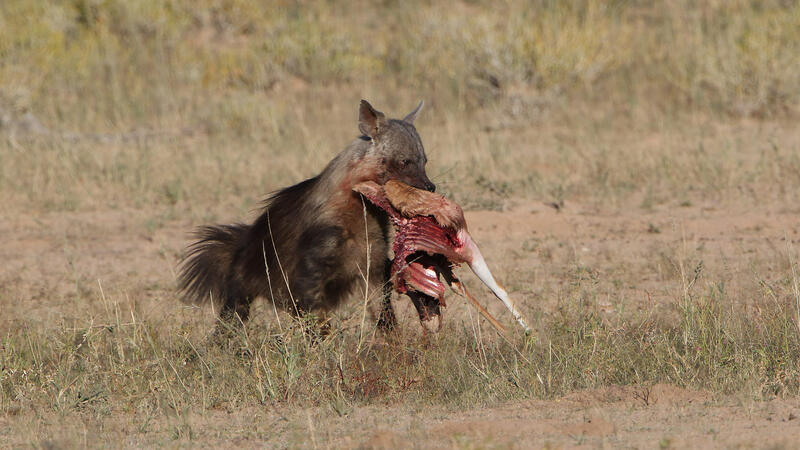 Those two species, though, are uncommon in the latter's heartland, and lions there tend to be seasonal and localised forces – so in the drylands of southwestern Africa, the brown hyena is effectively top dog most of the time. 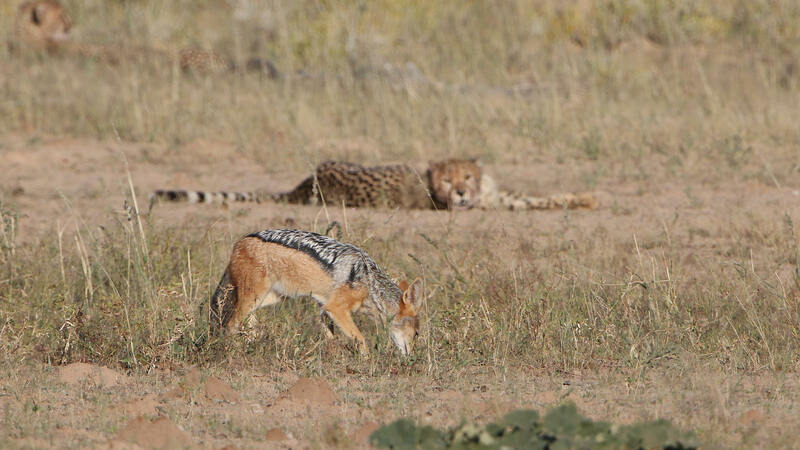 It may be easier to ooh and ah over the cheetah's high-speed chases, but we should also admire the brown hyena's resourceful resilience in the lean Kalahari dune scrub. It covers a lot of ground in a given day (actually night – it's primarily nocturnal), angling around scenting the air for intriguing aromas. When ungulates and their predators are plentiful during the wet season, the hyena focuses as much as it can on scavenging. In the dry season, when herds are gone or scattered, it omnivorously supplements scarcer carrion with wild melons, insects, and any small game it can flush and run down. 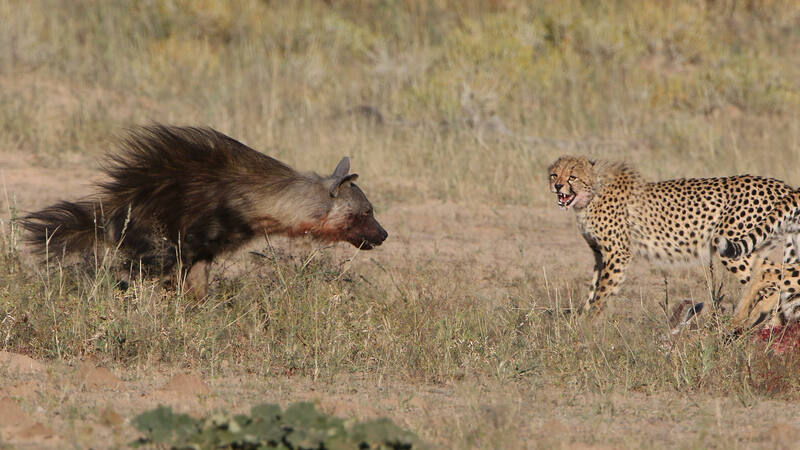 And while the brown hyena usually forages alone, it's not exactly an antisocial character. Resident males and females share large, overlapping clan ranges, crossing paths amiably along travel circuits and over much-prized remains of large mammals and raising cubs communally; nomadic males, meanwhile, roam around mating with clan ladies. 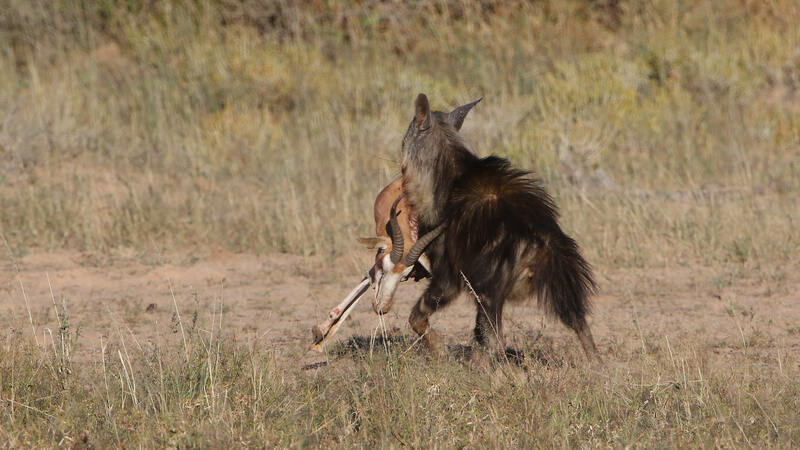 Brown hyena bumps into a jackal ... inside a giraffe carcass! The lucky dogs made off with free dinner.